"I got the tattoo in Boone, North Carolina at Speakeasy Tattoo, the artist was Greg Kinnamon. 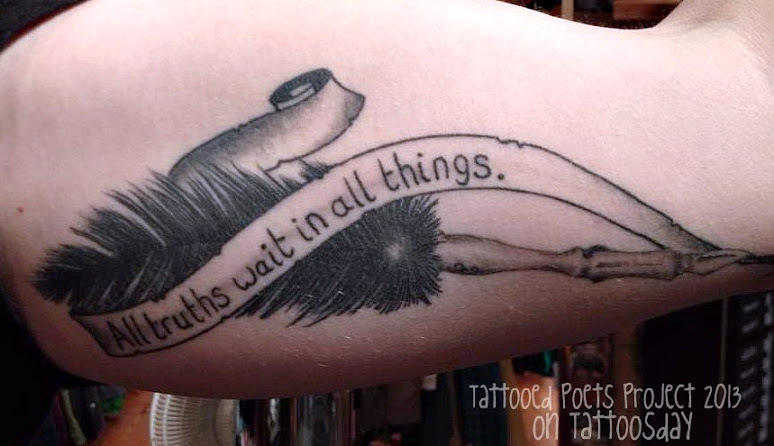 The line ["All truths wait in all things"] is from [Walt] Whitman's "Song of Myself". I got the tattoo when I moved from the mountains to NYC to begin an MFA at NYU. A reminder to look at the world with an open mind and appreciate the people I meet and places I go." surveying for oil near the Arctic Circle. jammed in the permafrost of the Brooks Range. Ryan was born in Ontario. played a soldier in "The Notebook". of North Carolina spread out like a quilt. overhead a flock of geese point their "V"
Matthew Wimberley grew up in the Blue Ridge Mountains of North Carolina. He served as an assistant poetry at the Raleigh Review and currently is studying poetry in New York University's MFA program. He was a finalist for the 2012 Narrative 30 Below Contest and his writing has appeared or is forthcoming in: Rattle, Puerto Del Sol, Birdfeast, and various other journals, including Connotation Press where his poems were introduced by Dorianne Laux. He has two dogs and spent March and April of 2012 driving across the country and back. Matthew resides in Brooklyn. Thanks to Matt for sharing his poetry and tattoo with us here on the Tattooed Poets Project on Tattoosday!